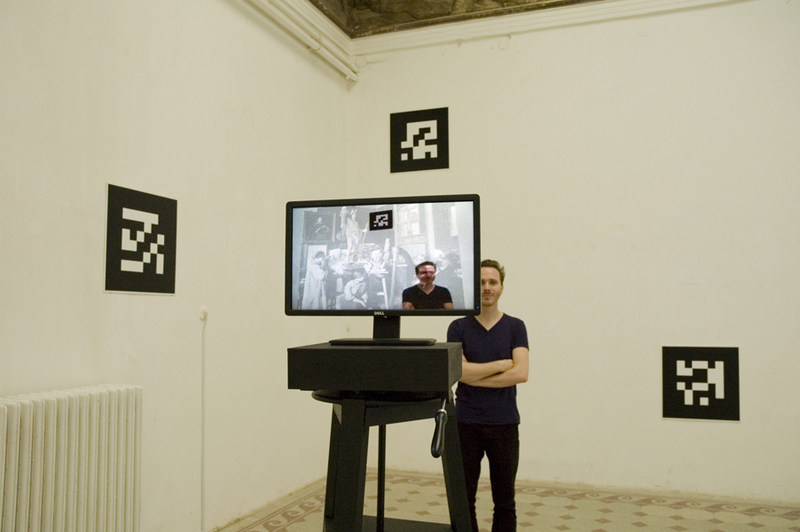 Time and memory became the main topics of an experiment based on Augmented Reality. The installation was part of a PhD research project into the artistic usage and possibilities of immersive and augmented virtual reality. 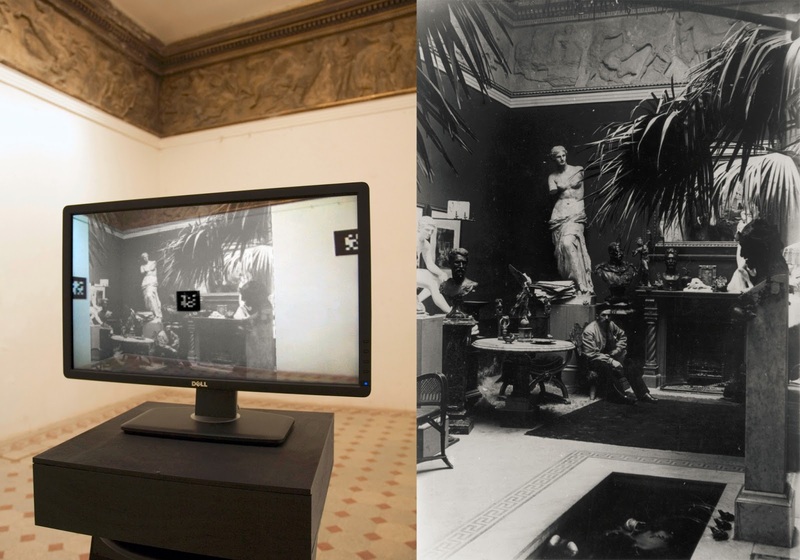 Using Augmented Reality, the past and the present placed together, and time passed became visible. Would it be possible to recall a place with interactive technology? Could virtual systems take us somewhere else in time? Alongside these questions, the main idea was to show the layers of time in connection with technology. Furthermore, the experience intended to investigate the possibilities to observe a space in relation to time and history. The inspiration came from a specific space, an exhibition hall in Budapest called the Parthenon-Frieze Hall. At the beginning of the twentieth century the room was the atelier of artist Alajos Stróbl (1856–1926), who was one of the initiators of fine art education in Hungary. The atrium used to be nicely decorated with a fountain, a gold fish pool, palm trees, Persian carpets and the stucco walls were painted the color of Pompeii red. The history of the hall is well known, but the interior changed over the time until it was transformed into a white cube space; only the frieze shows some of the richness of the previous periods. The reconstruction of this interior was the main goal of the project. 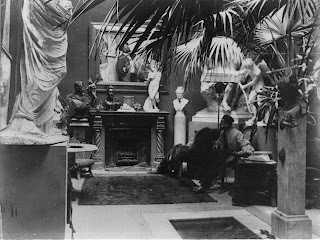 Archive photographs of the building were found in the collection of the owner’s grandchildren, and several articles helped to imagine and recall the decoration. The pictures were taken at the beginning of the last century. Most of them were made by the artist’s wife, Alajosné Stróbl (Louise).Taking photographs then required longer exposure time and wider aperture, so she needed a camera stand. Considering the structure of the room, and the equipment needed, there was only a limited space for a tripod. There was one specific area where several pictures were taken. It was a spot close to the sculptor’s table. It is just a speculation, but that table could have served as a base for the camera to sit on. No matter if this is true or not, the fact that these pictures were almost taken from the same position, allows us to look around, like in a panoramic picture. Only an interface is needed to visualize this. 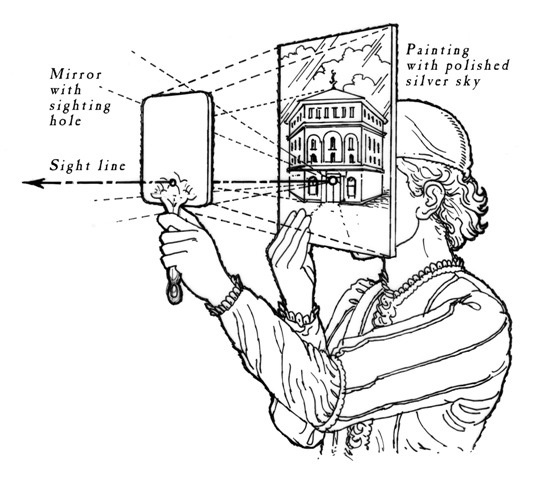 From the technological side, AR seemed to be the best solution for projecting the images in their original positions. Luckily the relief running around the wall served as a perfect pattern showing the appropriate size and the actual positions of the captures. After linking the photos to the AR markers, they just needed to find their original position in the space. Supervisor of the project, Dr. Zoltán Szegedy-Maszák, head of the Doctoral School, offered his assistance to develop the idea. 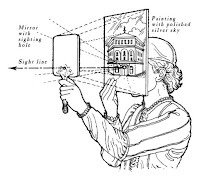 Since he had made several AR based artworks in the early on in the development of Augmented Reality, he helped to modify his own software for the new parameters. 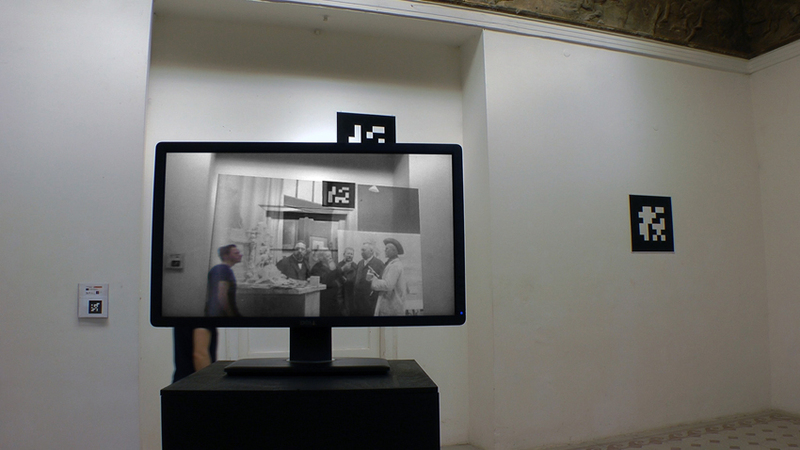 When visitors entered the space, they saw the empty walls with AR markers placed around as well as the monitor on the top of the sculptor table. 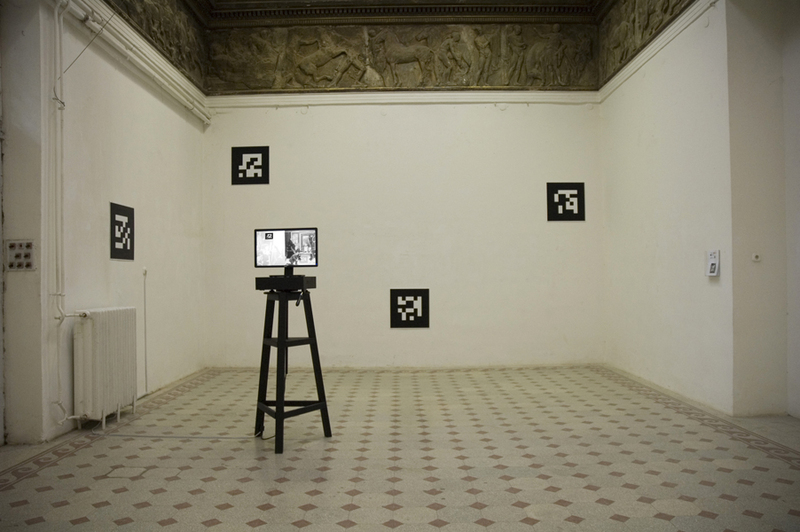 The classical interior with the geometrical black and white AR markers strongly contrasted each other. This particular exhibition place is known for showing more ‘classical’ media, in that sense, high-tech equipment on the top of a sculptor table can be also considered as a different statement. The copy of the master’s table served as a tripod. A monitor with a webcam on its back was visualized the AR experiments, while a small laptop with the software was hidden inside the table. 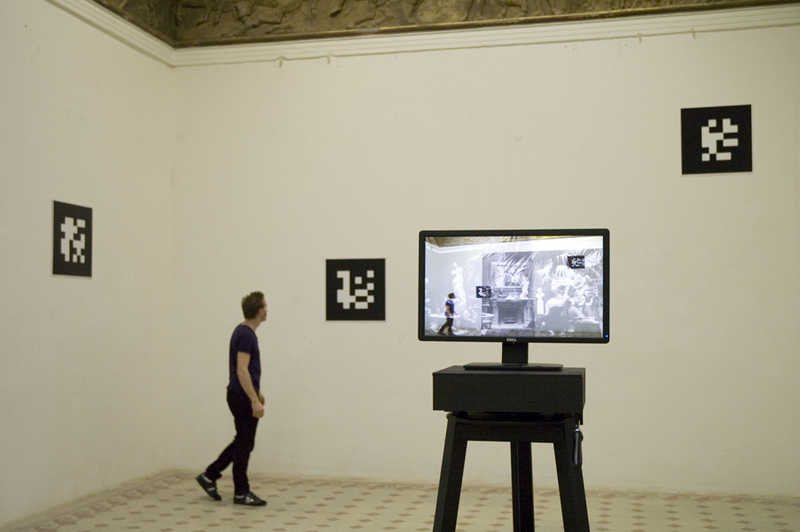 The camera and the tripod handle invited the visitors to move the screen; when the camera captured the AR markers, the images appeared. Pictures with different transparency sometimes make the past, or the present more visible. 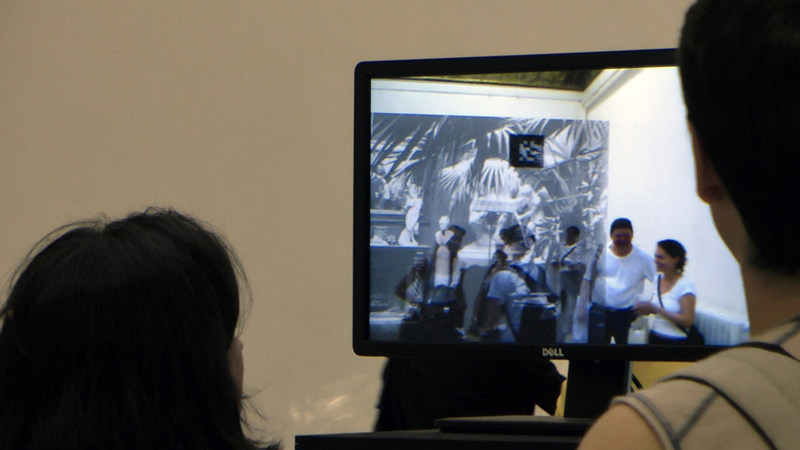 The physical space was filled with digital information and on the screen they became one. Moving the screen around the space enabled visitors to observe the room in different periods of time, and turning the monitor 360° around, made it possible to experience the reconstruction of the whole space. The reaction of the audience varied. Some visitors were grateful about recalling the shine of each period, and considered the installation as a kind of interface that displays cultural heritage. Others enjoyed watching people walking in the background, so they got a more merged view. The result was a feeling close to time travel. Some visitors even asked to develop the work in a way that they can walk in the picture while they also can see the image. They wanted to be inside the screen, what really is a step to consider next. While we augment the space, the project proved that if the supplements have something to do with the real space, if the two have a strong tie, we might believe that they are one. Archive pictures can give us information from previous times, but if we can interact with them, or step inside them, maybe it will lead us toward a new kind of relation with time. The installation was supported by the EU as part as the TÁMOP project. The work could not have come into existence without the help of the supervisor Dr. habil DLA Zoltán Szegedy-Maszák. Thanks goes out to the Stróbl family’s generosity for sharing their archive. The project leader is also really grateful and would like to thank to the AR Lab for their support, especially to Wim van Eck for the technical advice, and Yolande Kolstee for the individual assistance. Valós és virtuális világ határai elmosódnak, a Kibővített Emlékezet  interaktív videó installáció arra teszek kísérletet, hogy ezt a folyamatos az idő és az emlékezet szempontjából is megvizsgálja, azaz egymásra helyezzem a két területet. A kutatás az immerzív és augmentált virtuális valóságok lehetőségeit vizsgálja a képzőművészetben. A projekt megvalósítására a budapesti Epreskert Parthenón-fríz termében került sor. E térben alkotott egykor Stróbl Alajos szobrász, aki számos híres magyar személyiség portréját készítette el, ott, az Epreskerti műteremben. Kutatásom során számos archív felvételt találtam, melyek - bár különböző időben, de nagyjából - az 1900-as évek elejéről származnak. A teremben készült fotókat kódokhoz rendeltem, és azokat eredeti helyükre pozícionáltam. Egy monitoron keresztül így lehetőség nyílt, - ha csak elméleti síkon is, a tér különböző időben való szemlélésére. Az interfész forgatásával lehetőség nyílt megmutatni a tér több mint száz évvel ezelőtti állapotát. Az Augmented Reality (AR) kibővített tér szoftver kódok segítségével ad hozzá a látványhoz, megjeleníthet két vagy háromdimenziós alakzatokat, de akár animációt vagy hangokat is. Munkámban a szoftver felhasználásával egymásra csúsztatom az idősíkokat, a valódi teret hozzáadott információkkal egészítve ki. * PROUST Marcel: Remembrance of Things Past (In Search of Lost Time) [1913—1927] Vol. V, The Captive , ch. II "The Verdurins Quarrel with M. de Charlus" (1929 C. K. Scott Moncrieff translation) "The only true voyage of discovery (…) would be not to visit strange lands but to possess other eyes (...)” magyar kiadás: PROUST Marcel: Az eltűnt idő nyomában: 5.köt. A fogoly lánya, Bp. Atlantisz 2001.ISBN:9639165476, p.293. [2.kép] Filippo Brunelleschi (1377-1446) a lineáris perspektíva bizonyítása tükör segítségével. 15. század.